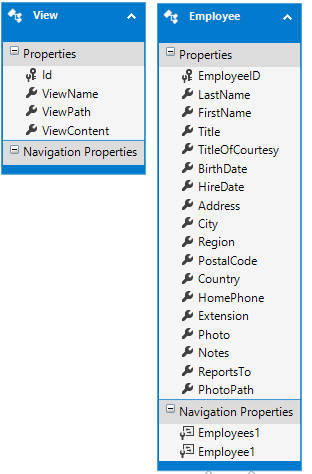 ASP.NET MVC organizes view files in the Views folder. This arrangement works fine for most of the applications. However, in some cases you may need to load views from database rather than physical disk file. Consider an example wherein you are building a portal or a content management system. You may want to allow the administrator to create or modify views and then you may want to load these views dynamically. Such dynamically created / modified views may not be a nice fit into the folder based arrangement of MVC. In such cases the recommended way is to store views in a database and load them on the fly. This article discusses how t his can be accomplished. You can add the Views table in any existing database or create a database in App_Data specifically to house Views table. The Views table has four columns - Id, ViewName, ViewPath and ViewContent. The ViewName column stores a developer friendly name of a view. This name is purely for your own use and identification. The ViewPath column stores the path of a view from the root folder. For example, /Views/Home/Index.cshtml. Note that ViewPath is not a ~ qualified path. This simplifies your code that checks existence of a view (you will see that later). The ViewContent column holds the actual content of a view. This can be HTML markup and / or Razor code. The Index() action simply pulls all the Employee records into a List and passes that List to the view. It also sets Message property on the ViewBag. The Message property has been added just for the sake of testing. The Index view is quite straightforward and simply outputs the model data (Employees) and ViewBag message (Message) to the response stream. You can run the application and see whether the view displays the Employee data and Message as expected. Now comes the important part! Copy this whole view content and paste it into the ViewContent column of the Views table that you created earlier. And then DELETE this Index.cshtml file. That's because we want to load views from database and not from physical disk files. Also set the ViewPath column to /Views/Home/Index.cshtml. The key part of our solution is the creation of a custom VirtualPathProvider class and a VirtualFile class. A VirtualPathProvider does the job of picking the views from disk, database or any other location. In our case it will pick views from database. The views picked from database are wrapped in a custom VirtualFile so that MVC framework can further deal with it. The BinaryIntellectVirtualPathProvider class inherits from VirtualPathProvider base class. The VirtualPathProvider class resides in System.Web.Hosting namespace. It then overrides a few methods of the base class namely FileExists() and GetFile(). 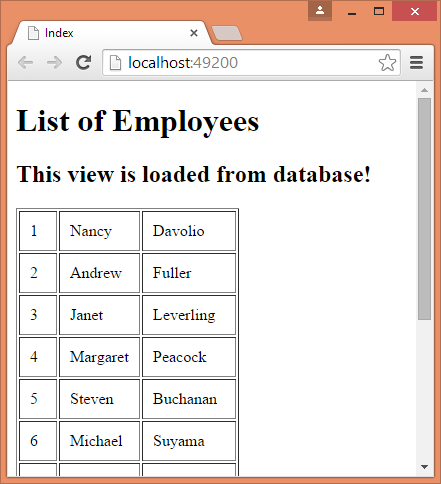 There is also a helper method GetViewFromDatabase(). The GetViewFromDatabase() method retrieves a requested view from the database (Views table) and returns it to the caller. The same method can be used to determine whether a view exists in the database or not. For example, if GetViewFromDatabase() returns null it indicates that a requested view doesn't exist in the Views table. The FileExists() overridden method checks whether a view exists in the database. If it doesn't then it calls the FileExists() of the base class, otherwise it returns true. The GetFile() overridden method does the job of retrieving a view from the database and returning it to the caller. The method first checks whether the requested view exists in the Views table. If it doesn't then it calls the GetFile() method of the base class. If the view exists in the database it creates a new instance of BinaryIntellectVirtualFile class (discussed shortly). The virtual path and the view content (ViewContent column) are passed to the constructor of the BinaryIntellectVirtualFile class. Notice that the view content is passed after converting it into a byte array. This is because BinaryIntellectVirtualFile class writes this content into a MemoryStream and MemortStream requires its content as byte array. The BinaryIntellectVirtualFile class inherits from VirtualFile base class (System.Web.Hosting) and overrides Open() method. Notice that the constructor of BinaryIntellectVirtualFile receives view content as a byte array. The Open() method constructs a new MemoryStream based on this byte array and returns the MemoryStream to the caller. To register a custom VirtualPathProvider you use HostingEnvironment class from System.Web.Hosting namespace. The RegisterVirtualPathProvider() method accepts a new instance of a VirtualPathProvider class (BinaryIntellectVirtualPathProvider in my example).